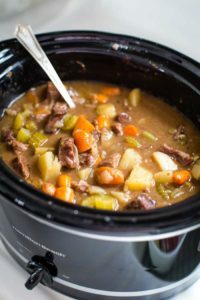 Even though it’s getting warmer here in NW Ohio, a good, easy crockpot potato soup is always appreciated! 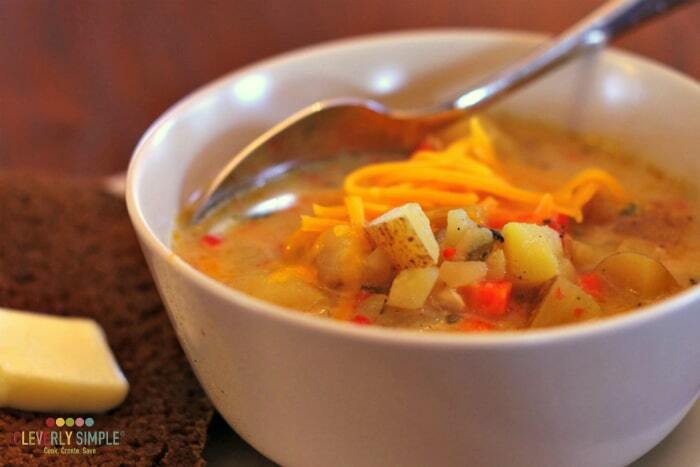 Potatoes make for an inexpensive and healthy start to a simple soup. 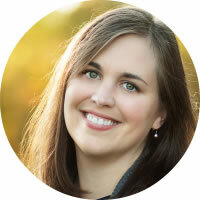 A dear friend named Caroline, who taught my husband and I how to cultivate an elegant taste, also taught us how to make her creamy and delicious potato soup. Julienned carrots, white onions, celery, fresh rosemary and yellow potatoes swimming in a sea of vegetable broth, whole milk, sharp cheddar and Velveeta cheeses. 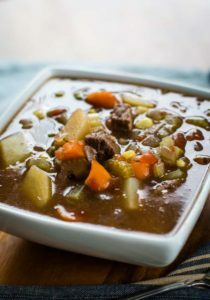 I loved this soup, but over the years, we found the need to adapt it. First of all, her method of cooking it on the stove wasn’t convenient for church potlucks or busy afternoons. In addition, our family doesn’t normally eat processed cheeses like Velveeta, but when I tried to make her soup without it, the cheddar would clump together and lack that creamy richness. What to do? After many a trial, I preserved Caroline’s soup, but with some minor adaptations that allow for the crock pot and my family’s taste. 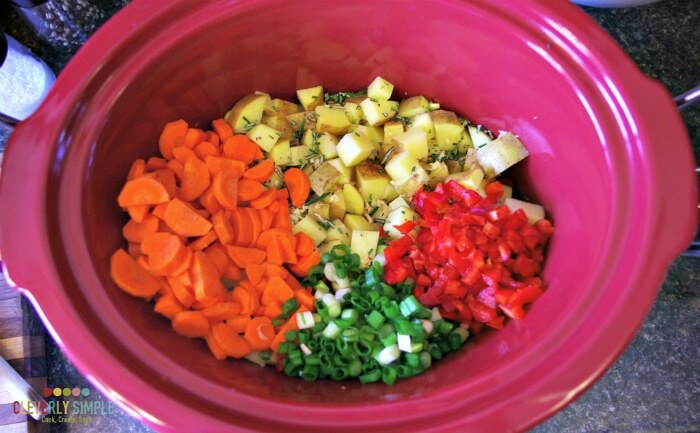 I replaced the celery and white onions with veggies like red pepper and green onion, which seem to prefer the slow cooker without sautéing first. I still incorporate her whole milk near the end of cooking, but leave out the cheese altogether. When served, we add shredded sharp cheddar as a topping and stir it in as we eat it. 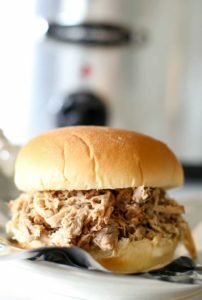 The result is just as flavorful as Caroline’s original recipe, but healthier and….cooked in the crock pot! Nothing processed, just simple ingredients slow cooked together to create this delicious soup. 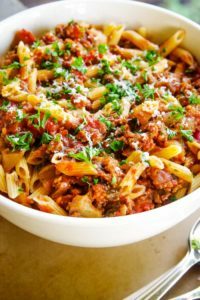 Paired with some fresh bread and you’ve got a hearty dinner any day of the week! 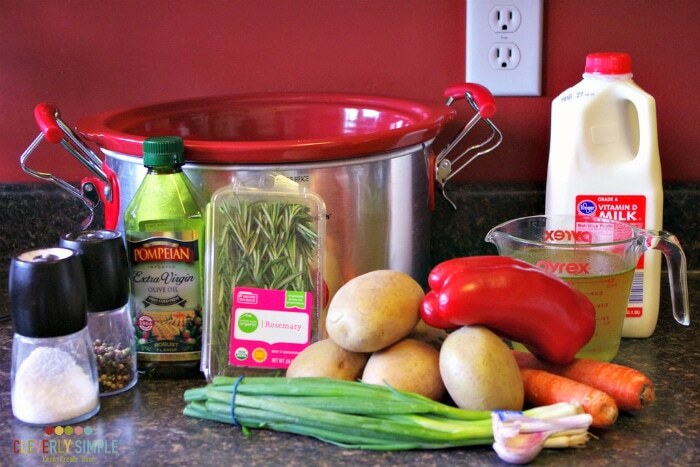 Here are the ingredients for the Easy Crockpot Potato Soup. Everything is found in your grocer’s produce section minus the broth, milk and olive oil. 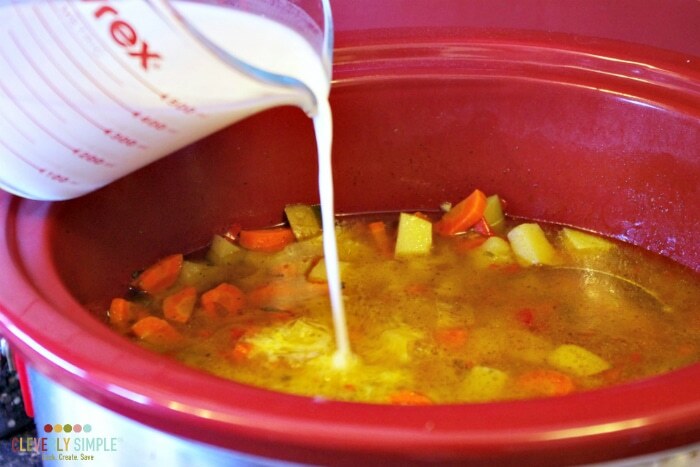 If you want to make this soup dairy free, you can substitute the whole milk for any unsweet milk alternative or simply enjoy the soup without milk at all! Start by cubing 2 lb. of yellow potatoes that have been rinsed, but leave the skins on! You won’t even notice them in the soup, but they add additional nutrition and who doesn’t like that? 🙂 Sprinkle 1 tsp. 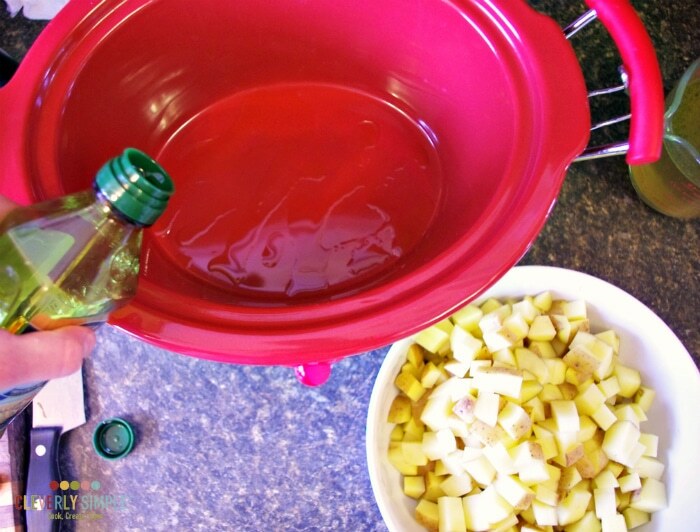 of olive oil at the bottom of your slow cooker and pour the potatoes on top. Chop two large skinned carrots (equal to 1 heaping cup), 2/3 cup of green onion, 1/2 cup of red pepper and mince 2 garlic cloves and 1 T. fresh rosemary. The fresh rosemary is what really sets this soup apart! 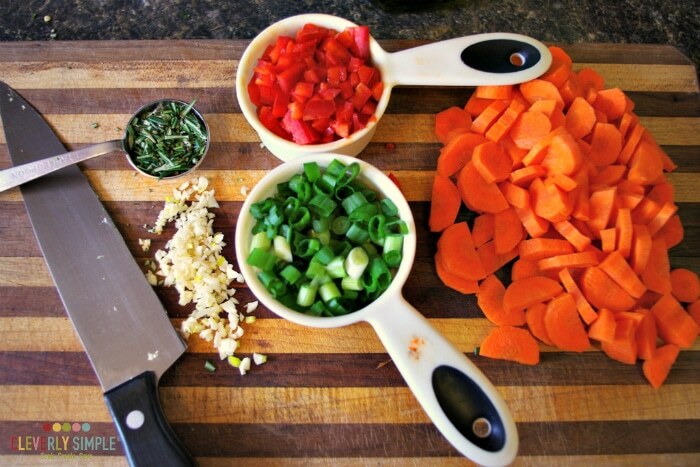 Add these chopped vegetables and spices to your potatoes and add about 1 tsp. salt and 1/2 tsp. black pepper. Next, pour 4 cups of vegetable broth over everything and stir. This is what it will look like before setting it to cook on high for 4 hours or low for 8 hours, undisturbed. I chose the 4 hours on high and took a nap during some of the cooking time. I woke up to a house that smelled marvelous! At this point, you can serve the soup as it is shown here if you don’t want to add milk. I actually pulled out a bowl for my daughter who is allergic to dairy. The soup will taste great, but it won’t be creamy. 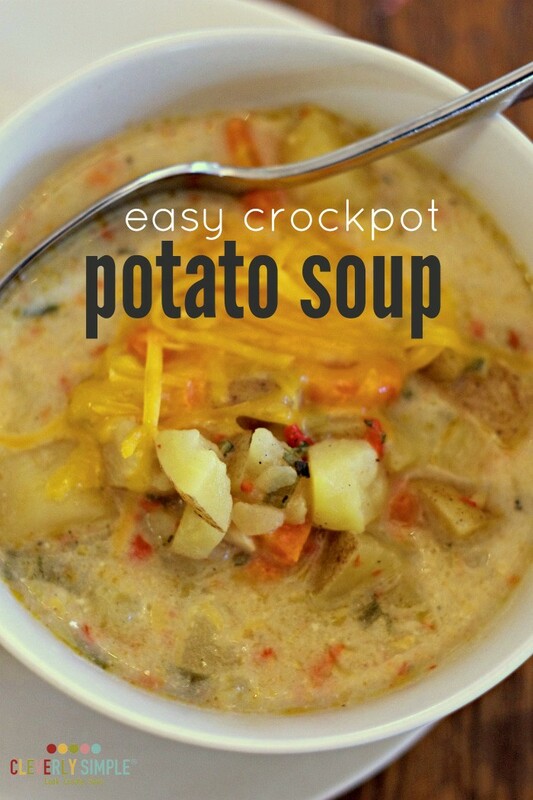 Ladle out scoops of this easy crockpot potato soup and top with some shredded sharp cheddar cheese. Serve with a nice big slice of fresh bread. Yummy! 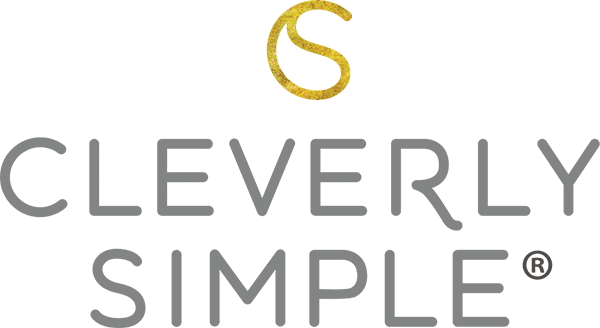 Want another simple potato recipe? You need to try these Crockpot Mashed Potatoes or these campfire Potatoes on Grill recipe! 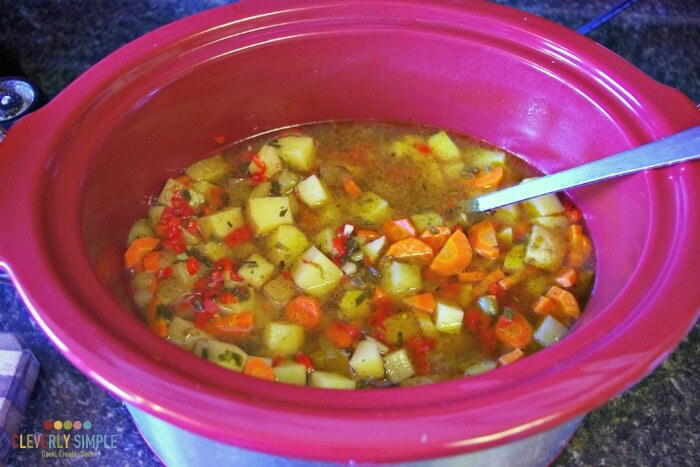 Easy crockpot potato soup seasoned with rosemary, garlic and red bell peppers. Sprinkle 1 tsp. of olive oil at the bottom of your slow cooker and pour potatoes on top. Chop two large skinned carrots (equal to 1 heaping cup), 2/3 cup of green onion, 1/2 cup of red pepper and mince 2 garlic cloves and 1 T. fresh rosemary. Add to the potatoes. Add 1 tsp. salt and 1/2 tsp. black pepper. 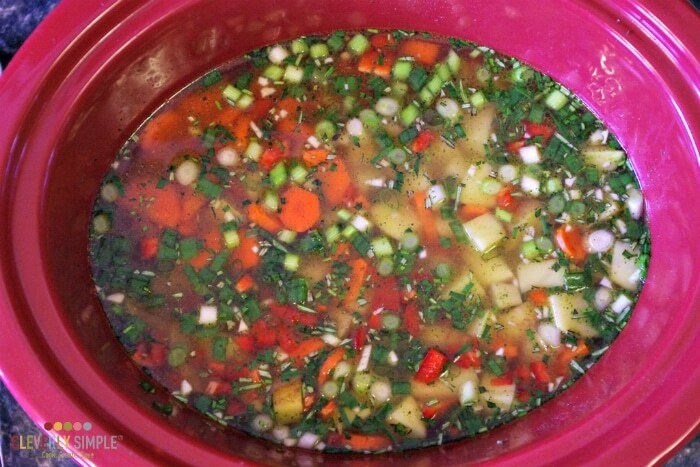 Pour 4 cups of vegetable broth over everything and cook on high for 4 hours or low for 8 hours.